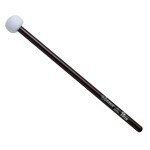 Vic Firth Corpsmaster CT1 Timpani Mallets -- General, are for all around playing. They feature maple shafts and synthetic felt heads for durability and weather resistance. Specifically designed to withstand the rigors of outdoor application, they are a great choice for indoor marching and concert playing as well -- especially for the program looking for extended durability from their timpani mallets! 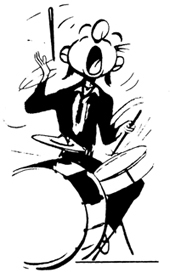 Head = 1 1/2"
Vic Firth Corpsmaster CT4 Timpani Mallets -- Ultra Staccato, have super-hard wool felt heads for durability and weather resistance. They feature maple shafts. Specifically designed to withstand the rigors of outdoor application, they are a great choice for indoor marching and concert playing as well -- especially for the program looking for extended durability from their timpani mallets! Hard. Head = 1 3/8"
Vic Firth Corpsmaster CT3 Timpani Mallets -- Staccato, have medium hard synthetic felt heads for durability and weather resistance. They feature maple shafts. Specifically designed to withstand the rigors of outdoor application, they are a great choice for indoor marching and concert playing as well -- especially for the program looking for extended durability from their timpani mallets! Medium hard. Head = 1 3/8"